The Louisville Independent Business Alliance (LIBA) will host the 10th Annual Buy Local Fair with a special Iron Chef-style cooking competition on Sunday, May 20th from 12:00 p.m. to 6:00 p.m. at Louisville Water Tower Park, 3005 River Road. Presented by Louisville Water Company, admission to the Fair is free, parking is $5 per car. Two chefs will go head to head with mystery ingredients at 3:15 p.m. and hope for a favorable ruling from a panel of four judges. Two of the judges are to be determined (one through a LIBA social media contest and another through a YELP affiliation), but the other two judges are Executive Chef Cody Stone from DECCA and Art Director and Foodie Rachel Quast, who from Common Table. The winning chef gets all the glory and returns to face off with a new chef the following year. 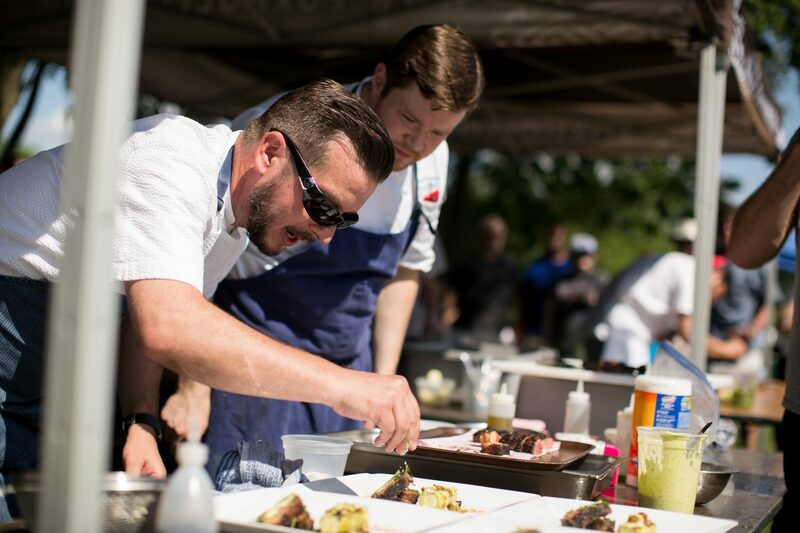 This year, Chef Jeff Dailey from Harvest is stepping in to represent Harvest’s win last year and will compete against Austin Cummins a previous chef and now salumiere at Commonwealth Cure, who makes meats for Foxhollow Farm. The two chefs have been given a list of 15 cuts of beef — ranging from ground beef to roast to steaks — from the farm to choose from in advance. Then, when the clock starts ticking at the competition, they will open a Rainbow Blossom Community Supported Agriculture (CSA – produce sourced from local farms) box of mystery ingredients and decide on the spot what they will cook, using a grill and a stovetop supplied by Trend Appliances and the help of a sous chef if they choose to bring one. An emcee will talk the audience through the competition before the judges make their decision based on the following criteria: taste, healthiness, and how easily someone could replicate the meal for their own family at home. “The idea is to make something fast, make something really good, but not make it super complicated, because they’re going to be using the ingredients that are really accessible to everybody,” said Foxhollow Farm’s Lauren Argabrite. The event will also feature a cocktail competition (details to be announced) and include booths from a variety of local businesses, artists and craftspeople, community organizations and farmers, as well as live music, a children’s area, a cooking competition, food vendors, and local craft beer, bourbon, brandy and wine. Follow LIBA for more information or visit keeplouisvilleweird.com/buylocalfair.